I chose a close reading question and created a scaffolded activity to help my 2nd graders prepare to answer close reading questions using the RACER technique. You must have a copy of the Storyworks Jr. December/January 2018 magazine to complete the activity. Students read the article and annotate, read the question on the top of the sheet, reread the section of the article listed in the question highlighting sentences that best support their answer. Students should have already been introduced to the RACER technique in order to analyze each sentence. 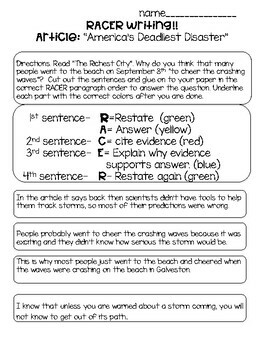 If you like this freebie I have an editable version for sale that allows you to insert your own close reading question and RACER sentences.